If you’re halfway through your little “remodeling kitchen” project, there is one thing that requires your undivided attention – a kitchen faucet. 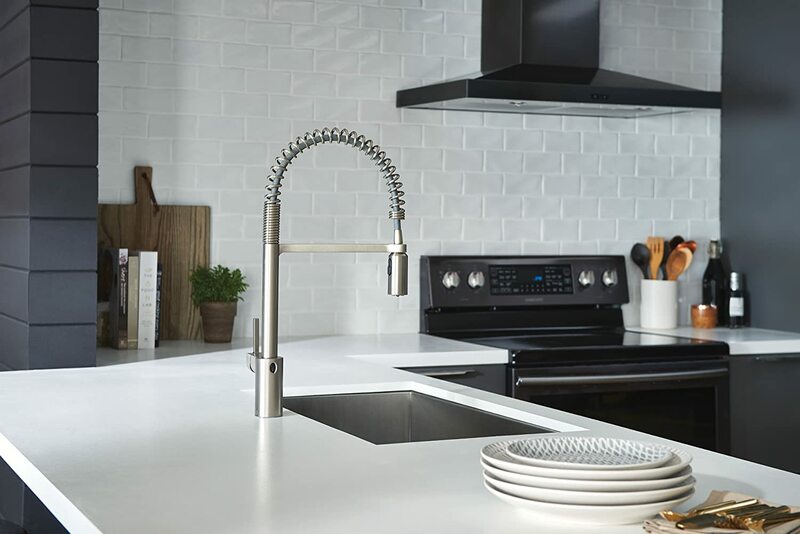 Now, you may think that you can buy just any model that fits your budget and go with the flow… But, we’d say that buying a reliable kitchen faucet that even cost a bit more will prove as a wise choice in time. Best kitchen faucets make a variety of kitchen tasks such as washing the dishes, bathing the baby, etc. easier to complete. They don’t leak or corrode, plus they enhance the look of the kitchen. Our buying guide and kitchen faucet reviews are here to help you choose the right model for your kitchen, so keep on reading. Knowledge is power! That said, there are some things you should know about kitchen faucets, and we’re sharing them with you. These things will steer you in the right direction and help you find just what you need. There are two types of faucets – sink mounted and wall mounted. Sink mounted units allow for more control since most of these come with a pull-out spray head. This allows you to clean the dishes much easier and faster. However, even if you opt for a unit without this special spray head, a sink mounted faucet still allows for better use. 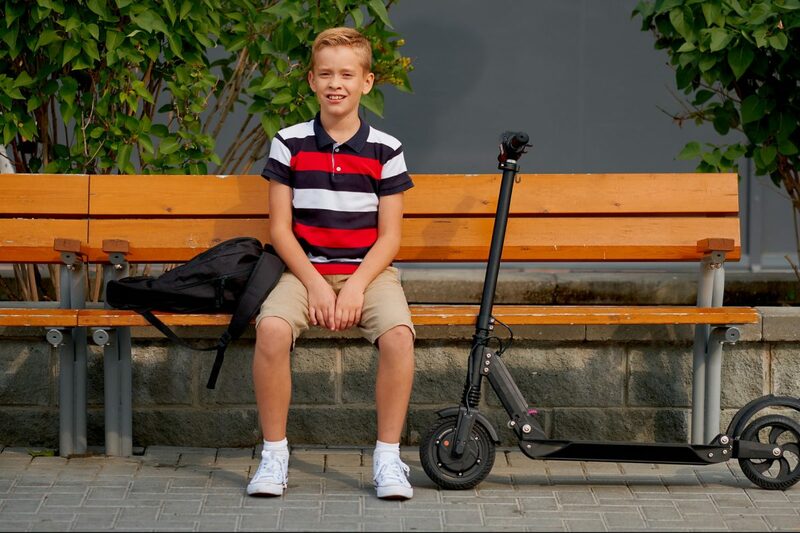 Wall-mounted units are fixed, which means maneuverability is limited only to the left and right. These models also don’t come with a pull-out spray head, making them far less practical and functional. Next, you need to decide which faucet style would be best for your needs. Single-handle faucets (also known as one-handled) are a popular option due to a single-hand operation and easier installation (they require one or two holes). Since they feature a one lever/knob, you can quickly switch from cold to hot water. There are also two-handle faucets. These allow you to adjust the temperature and water flow just the way you like or need. Double hand units need three different holes for installation so they are more complicated for installation, especially if your sink doesn’t have the required number of holes. In this modern day and age, hands-free faucets don’t come as a surprise. There are designed with maximum convenience in mind. We all hate touching a faucet with messy hands. But, we don’t have to do that anymore! Touchless faucets are also great water savers, as they prevent water dripping. Here you can read various opinions about touchless kitchen faucets. Are good looks really so important? Polished, matte, arctic stainless, chrome, bronze– all these surfaces look great. The looks aren’t the most important though. It’s far more important to find a faucet that won’t stain or corrode over time. You’d also want to find out about the chemicals and cleaners you can and cannot use with your faucet. For example, some cleaners may have a too strong formula and cause the faucet to stain once the cleaner is applied. So, an easy-to-maintain faucet is something to look for. Luckily, best kitchen faucets are designed for both ease of use and stunning look. Designer kitchen faucets, unique kitchen faucets, or simple-looking ones – possibilities are endless – you just need to find the one that best matches your kitchen design. We talked about different faucet styles. Before buying the best kitchen faucet, make sure to check how many holes there are in your sink. Go for the faucet that matches the number of holes otherwise, you may need to buy a new sink and spend more money. If you can spend at least $200 on a kitchen faucet, we suggest you go with trusted brands as these deliver good quality products. Plus, they also offer a warranty, which is definitely something you’d want. Top-rated brands usually have a good customer service, and this is always a bonus because you never know when you might need to call them. Let’s take a look at this brief overview of kitchen faucets we reviewed. Go through our kitchen faucets reviews to see what each model offers so you can make an informed decision when selecting the kitchen faucet for your home. 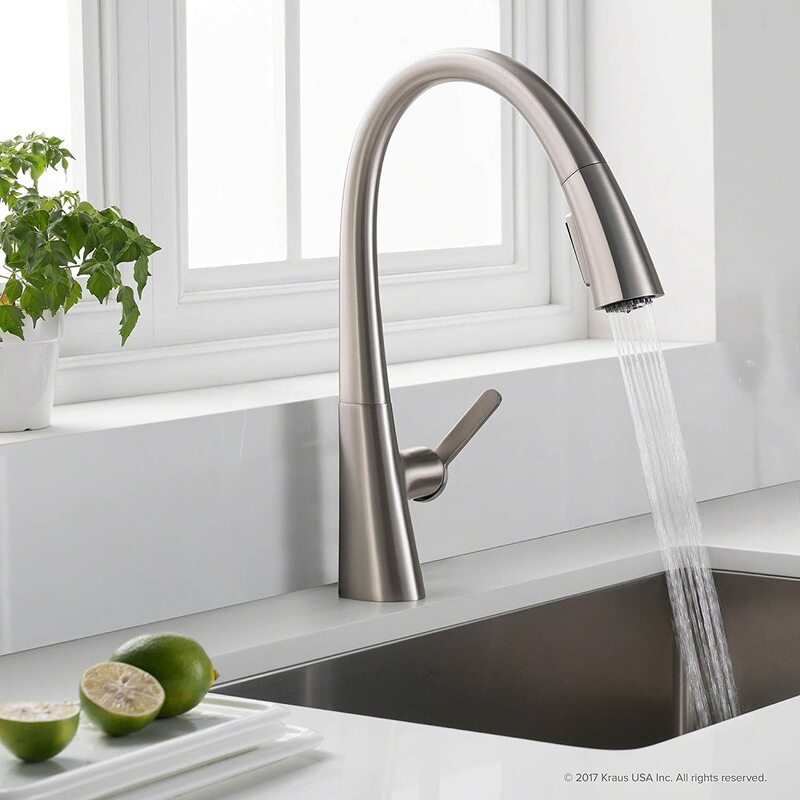 This model is among top-rated kitchen faucets for good reason. It will make cleaning the dishes and the sink much more enjoyable! The Moen faucet features two sensors for a hands-free experience. So, you’ll never again have to turn on the faucet while your hands are messy. This alone reason is enough to see why touchless faucets are so popular. There is also a lever – if you ever feel like using the faucet the old-fashioned way or to simply adjust the temperature and water flow. A hand movement triggers the sensor on top, while the lower sensor can be triggered by pots and other dishes. However, a minor annoyance is that sometimes the sensor won’t recognize what you put in front of it. High-arc and pull-down spray head helps you soak and clean pots and pans quickly, without splashing the countertop as well. The pull-down sprayer will also come in handy when you need to clean the sink. And when you’re done with cleaning, the spray head will retract back in place. There is also the Power Clean spray technology that ensures 50 percent more power to help you get rid of stubborn stains. The Duralock quick connect system makes installation simple so you can do it on your own. The model is available in three finishes – Spot Resist Stainless, Chrome, and Oil-rubbed Bronze for the perfect match. Delta has been a maker of top kitchen faucets for years now. The best part is that it just keeps getting better and better! It seems that this company precisely knows what their customers need and it strives to deliver that. This model is just another example of combining affordability, durability, and functionality to give homeowners the offer they cannot say “No” to. Oh, and there is also a lifetime limited warranty which further confirms the quality of Delta kitchen faucets. 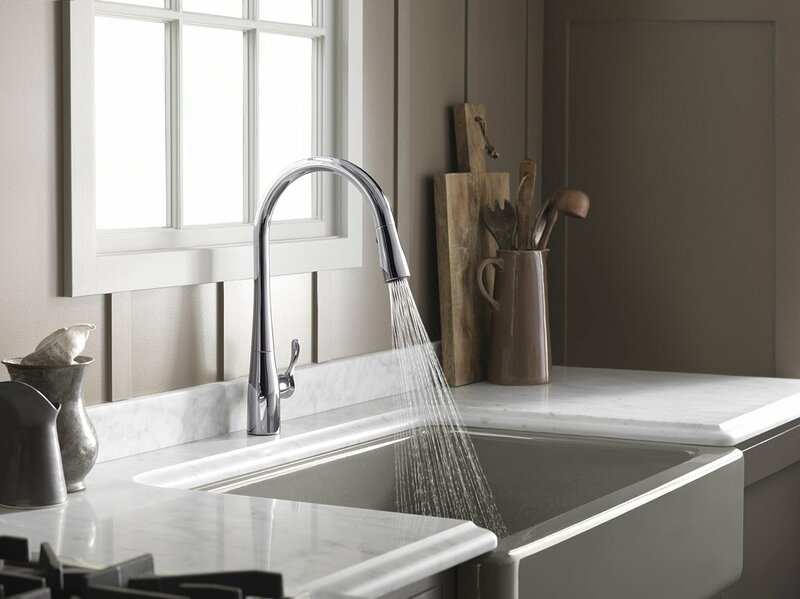 The Delta 9178-AR-DST Leland is among best unique kitchen faucets, and its stunning design is sure to become a focal point of your kitchen! Your guests will admire this faucet over and over again. You can choose from four designs the one that best balances your kitchen style. Here we have a single-handle model with a pull-down sprayer for handling the dishes much easier. What’s more, ShieldSpray Technology helps you tackle greasy and tough stains and mess on your dishes. 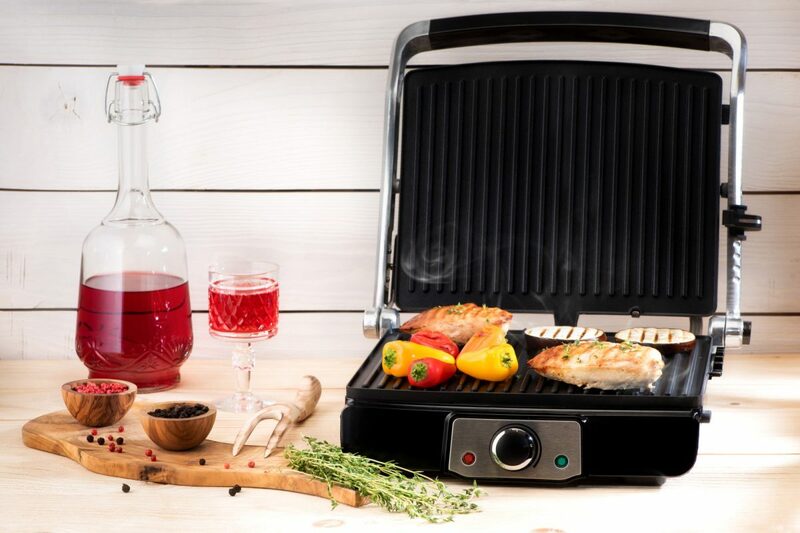 Cleaning after birthday parties, BBQs, and feasts won’t be so exhausting! Thanks to the MagnaTite Docking, the hose will stay fixed until you need it the next time. However, the hose is only 20 inches long and not as flexible as with Moen kitchen faucets. Thanks to the Patented DIAMOND Seal Technology, this faucet will perform well even after years of use as there won’t be leaking. Still, there is one thing to note here: the lever has to be positioned in the center, otherwise, after you turn the faucet off, the water will continue to drip. Cheap kitchen faucets work great as temporary solutions. If your old kitchen faucet broke, and you cannot afford a high-quality model at the moment, why not take a look at the WEWE single-handle kitchen faucet? This model is inexpensive and offers decent quality, hence it’s worth the money. This is a multifunctional unit that lets you control spray in three ways – stream, spray, and pause. In addition, the single-handle design makes flow volume and water temperature easy to control. And there is a high-arc swivel spout that helps you clean the dishes effortlessly and keep the sink clean. Apart from ease of use, this unit is also easy to install – you can even do it on your own. 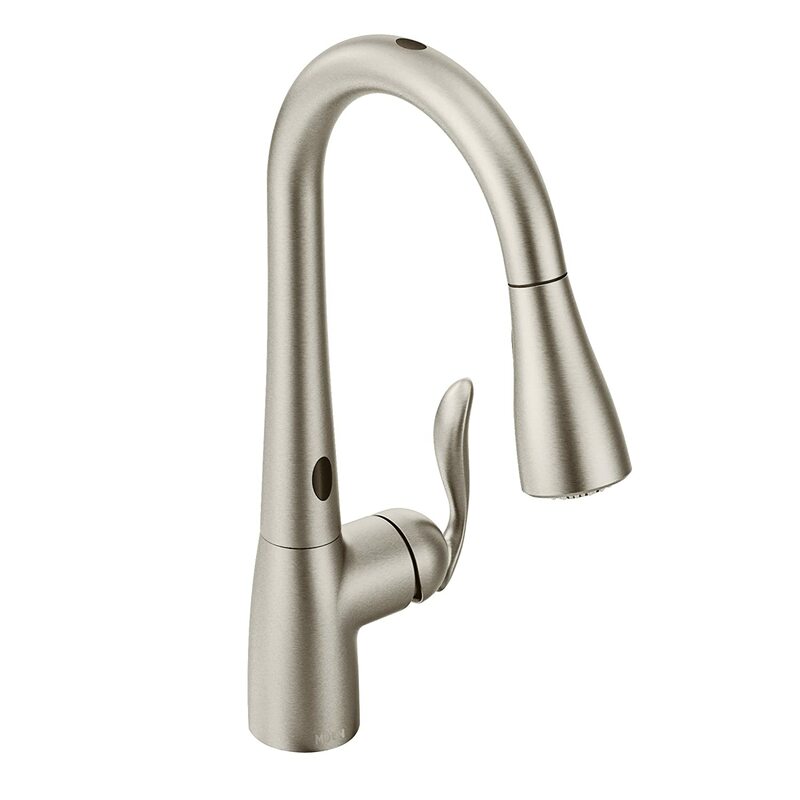 This kitchen faucet with sprayer looks nice and features a finish that prevents corrosion. You just need to clean it with a dry cloth to preserve its stylish look. On the downside, the hose is short. The Grohe Concetto is a pull-down high arc model that features a contemporary, minimalistic look. It will surely add a fresh touch to your kitchen! The Starlight Chrome finish will keep the faucet beautiful for years, as it is scratch and tarnish–resistant. In addition, the unit features a Locking dual-spray diverter that allows you to switch between spray and regular water flow in seconds. There is also a SpeedClean anti-lime system that helps maintain the good water flow. It will enable you to get rid of limescale with a simple touch. This model is reasonably priced, hence a good choice for those who want a mid-priced unit that will last for years. The kitchen faucet is well-built, ensuring stability. The installation is not very simple, so you might need an extra pair of hands to set everything correctly. If you’re looking for best commercial kitchen faucets, look no further! 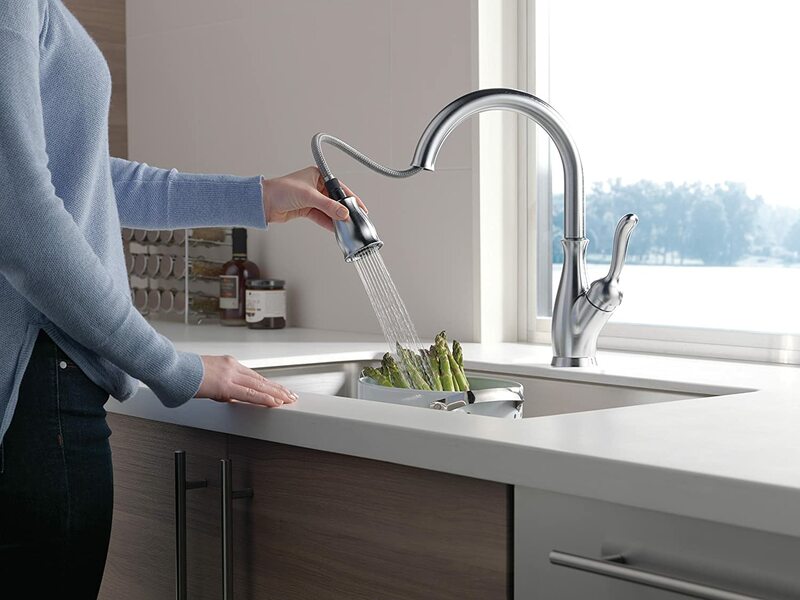 The Fapully kitchen faucet is designed with busy kitchens in mind. All-metal construction and ceramic cartridge make this faucet strong enough to withstand daily use whereas a 2-year replacement warranty puts your mind at ease. The Fapully kitchen faucet is highly functional as it features a faucet sprayer and a separate spout. You can wash the dishes and fill the pots simultaneously. Now, that’s convenient! But, what’s even better is that both sprayer and spout can rotate at 360 degrees for maximum accessibility. The secure docking will keep the pull out sprayer stable and secure when not in use. However, when you do need to use the sprayer, you’ll appreciate its lock design as you will be able to wash the dishes without holding the sprayer all the time. The single-handle allows you to control hot and cold water as well as to adjust water flow. The kitchen faucet also looks great, with its bold and modern look. It comes in Brushed Nickel and Brushed-Nickel LED – if you’d like to add a splash of color to your daily kitchen tasks. Furthermore, the unit comes at a very affordable price, being a good choice for anyone wanting to get a good quality kitchen faucet without exceeding the budget. The downside is that the instructions aren’t very detailed, so perhaps you’ll have to call a professional to install the faucet. Kraus is one of the leading manufacturers in the world of faucets, so choosing it would be a wise decision. The KRAUS Sellette faucet is beautiful, functional and comes at a good price. This model features a pull-down design, and it’s a great choice for large households, where the kitchen faucet is constantly used, and for all sorts of tasks (from washing the dishes to bathing the baby). The faucet features two spray modes – spray and stream mode. However, the latter is too strong and it can splash the whole sink and countertop. The faucet will keep looking like new thanks to All-Brite finish. 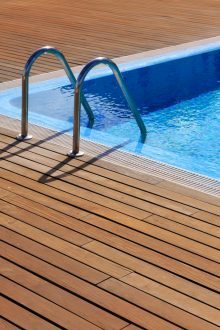 This special finish resists water stains, discoloration, and fingerprints. This eliminates the need for cleaning the faucet every time you’re finished with the dishes. This is one of best kitchen faucets 2019 out there because it’s highly durable and does what it’s supposed to do. The metal construction, ceramic cartridge, and lead-free waterway ensure this unit lasts for years, perhaps even decades. The Kraus Sellette comes ready for installation – so mounting hardware, waterlines, and optional deck plate are included. 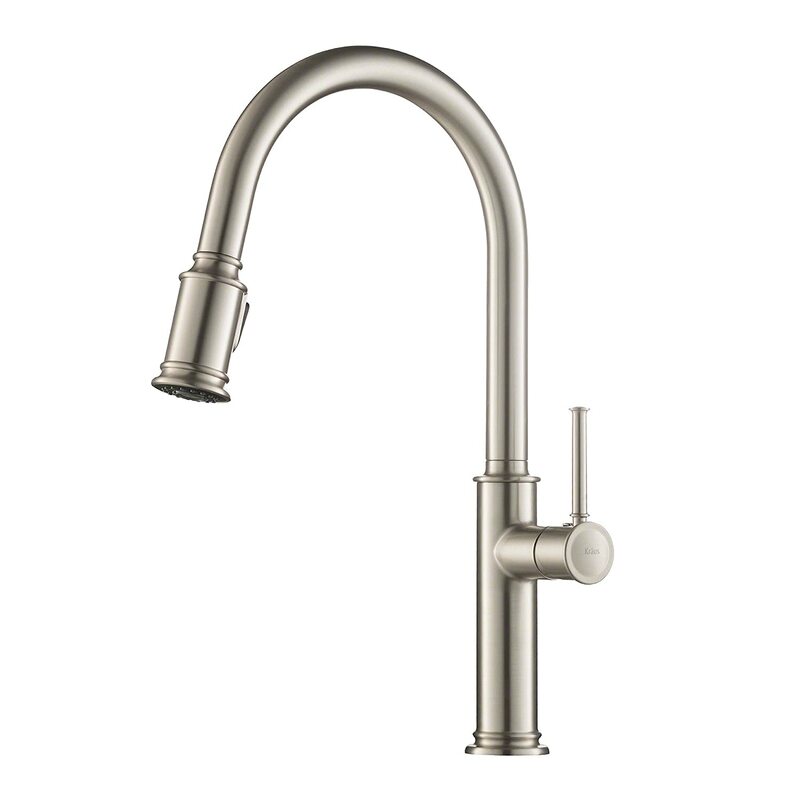 This Kraus Nolen kitchen faucet comes with similar features as the Kraus model we’ve just talked about. However, this one looks more stylish, with its lovely curves and a larger design. It’s also a bit more expensive. Featuring two spray modes – the aerated stream and powerful spray, the faucet makes cleanup a breeze. 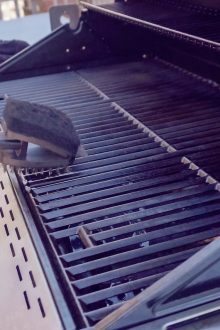 In addition, the flexible hose allows for easy movement and control for cleanest results. The durable construction and All-Brite stainless steel finish add up to convenience and functionality of this unit, making it a great choice for anyone looking for these qualities. 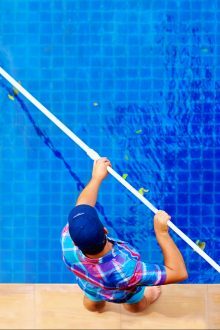 It’s also easy to install, but, if you aren’t handy, perhaps it’s better to call a professional to get the job done. 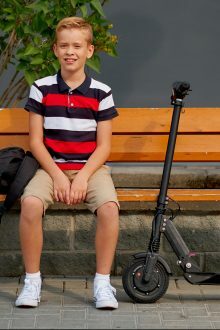 The Kraus Nolen only comes in one color. While the color looks great, not everyone would necessarily want it in their kitchen. Those who love simple and beautiful kitchen faucets just have to see this beauty! Whether you choose Arctic Stainless, Chrome, Matte Black or Venetian Bronze – this faucet can boost the overall appearance of your kitchen. More importantly, it can also be your ally in your fight against mess and dirt. The faucet features a button on the spray head and lets you switch between stream and spray. The spray is great for the dishes that aren’t very dirty, such as glasses and plates. Likewise, the stream is just what your messy pots and pans will need. Like best kitchen faucets, this one is also very easy to install. And since it comes from Delta, this model is also durable and won’t leak. It’s backed by a Lifetime limited warranty. This model features a 20 inches hose, and Magnetic docking to keep the hose and in place. Moreover, it is simple to clean thanks to Touch-Clean spray holes. On the downside, the faucet installs into the sink, so after a while, you will notice it loosened. This is not a big deal as you only need to tighten it again. However, it is a bit irritating. Here we have another Moen faucet, similar to the first one we reviewed. The Moen 5923EWSRS is worth every penny! 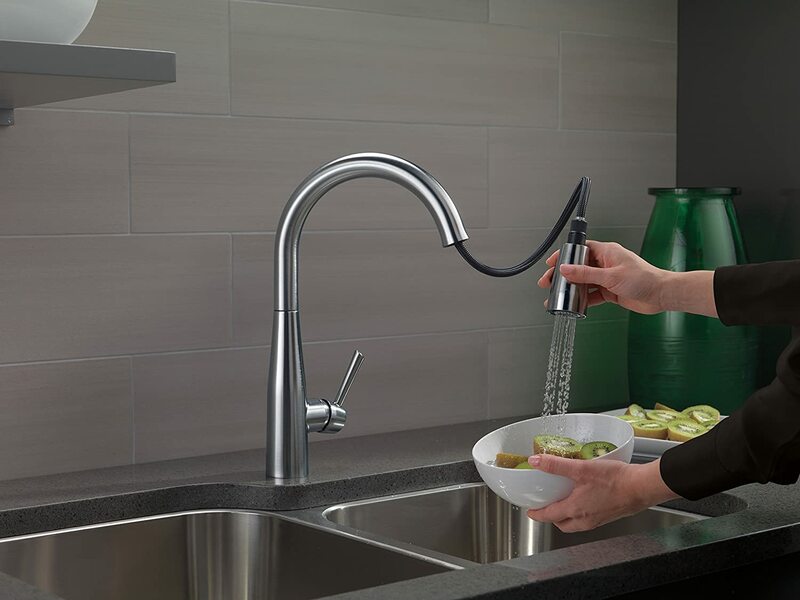 It’s powerful, flexible, and reasonably priced – being the best touchless kitchen faucet on the market. The ultra-flexible hose makes cleaning dishes a piece of cake. You’ll have much more control over the spray head, and will be able to maneuver the hose precisely where you want it. In addition, you’ll save time washing big pots. Just like the other Moen model we’ve talked about, this one also features the Power Clean spray technology so you also get more spray power. The faucet is meant to suit 1 or 3 holes and thanks to the Duralock quick connect system, it’s easy to install. However, the escutcheon is not included, so you’ll have to buy it separately. 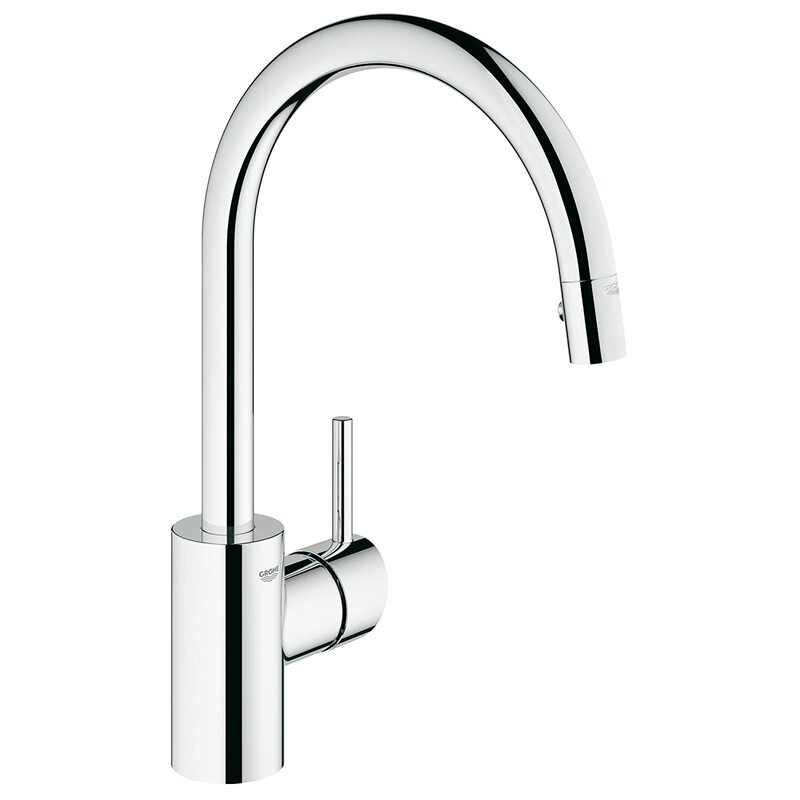 This model is among luxury kitchen faucets as it looks sophisticated and sleek. It will be a perfect addition to your modern kitchen with its easy-on-the-eyes design. 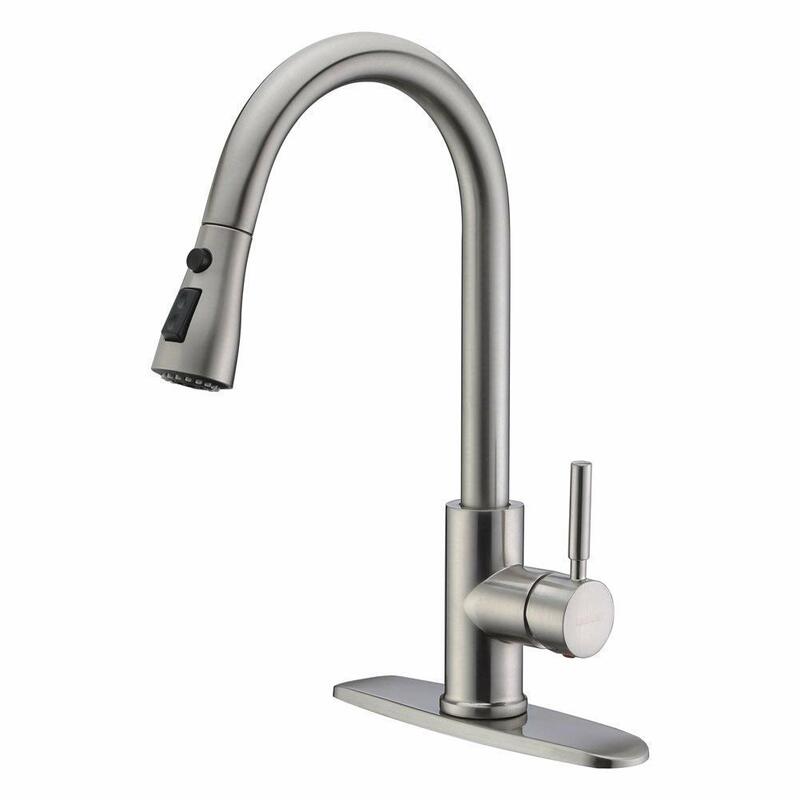 Passionate home cooks need the right kind of equipment, including best kitchen sink faucets. 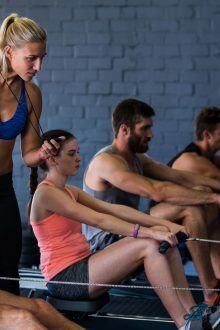 The right equipment will make achieving the desired results possible and a whole lot easier! With that in mind, here we have the KOHLER Simplice kitchen faucet that will make your life in the kitchen simpler, easier, and less tired. KOHLER is among the best faucet brands and its products are of great quality. Thanks to this unit, you won’t have to wash the dishes for 3 hours after you’ve done with cooking. The faucet has a hose and a three-option spray headstream, spray and pause to fit a variety of kitchen tasks and activities. While the High-arc spout comes with 360-degree rotation for ease-of-use, the MasterClean spray face resists mineral buildup for easy cleanup. Coming in three colors – Vibrant Stainless, Polished Chrome and Matte Black, the faucet can fit any kitchen interior. However, this model can look slightly big on the sink unless you already have an oversized kitchen sink. Kitchen faucets are one of the most important features in our kitchen, and as such, they should be of high-quality, long-lasting, and designed to withstand the rigorous daily use. 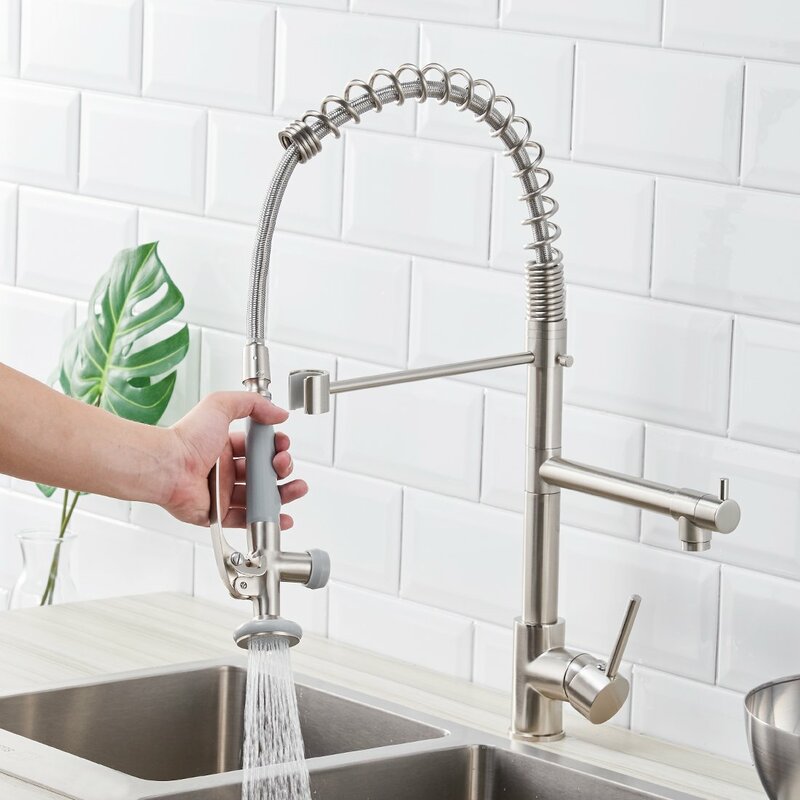 Best kitchen faucets 2019 that we reviewed here are great in their own ways and are also distinctive, so they can fit the wide range of homeowners’ needs and means. However, we’d say that the Moen 5923EWSRS could be the best kitchen faucet for everyone looking for maximum convenience and ease of use and don’t mind spending more money to get that. 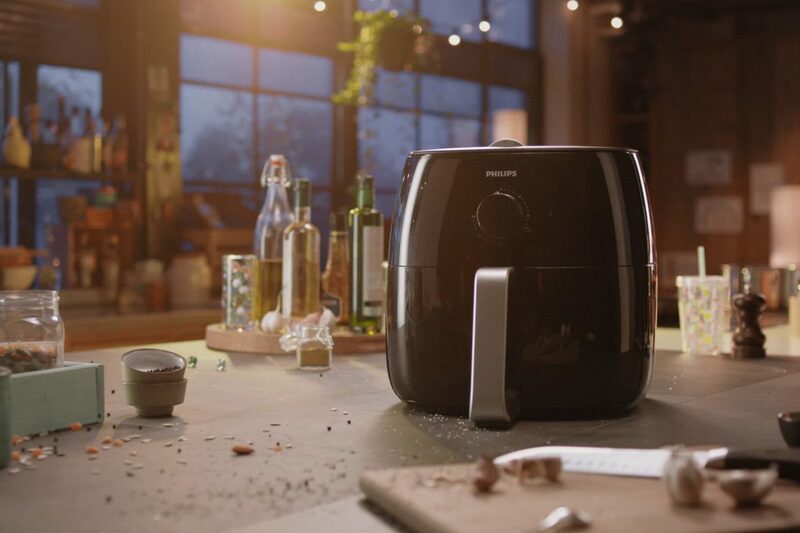 This model makes boring and exhausting kitchen tasks a little more bearable and a whole lot easier!